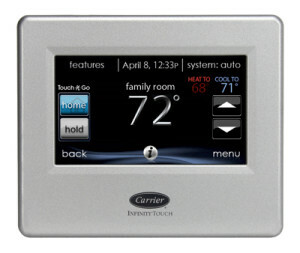 The unrivaled capabilities of the Infinity control represent the highest degree of comfort management. This communicating control is designed exclusively for the Infinity system products and is the brains behind the ultra-efficient Greenspeed™ intelligence systems. What’s more, techno lovers will rejoice over the Infinity control’s energy management and remote access features. 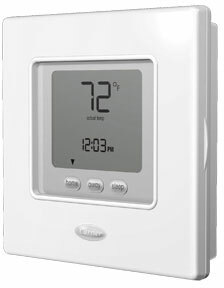 Programmable scheduling allows you to easily customize settings for times when you’re home, sleeping or away. You can operate your system even when you aren’t there because this Wi-Fi device can be controlled via the free mobile app. 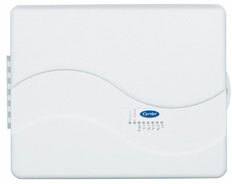 This wall-mounted, low-voltage unit is 7-day, 5/2-day and 1-day programmable. There’s no need for batteries to store settings. During power loss, its internal memory saves your preferences for an unlimited time with a clock that continues to run for at least 24 hours. The heart of a smarter home. Your heating and cooling system is where you spend most of your energy dollars so saving on your utilities is important. 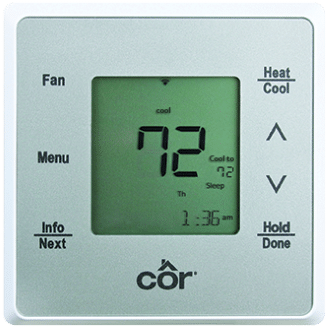 The innovative Côr thermostat is designed to combine home comfort with reduced energy use; homeowners saved an average of 20% on their heating and cooling energy costs. 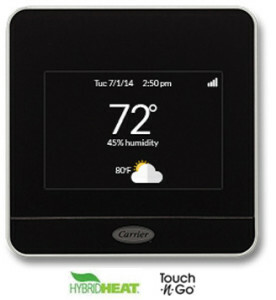 It’s what we call the heart of a smarter home. 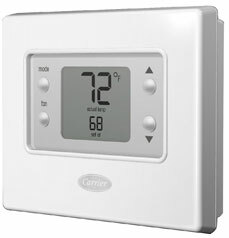 Carrier’s Comfort Programmable Thermostat provides enhanced control capability for maximum performance, reliability and indoor comfort. The sleek, contemporary design fits with any home décor.